We heard something about free lattes down at the Create tent at SXSW and naturally, had to drag our sleep-deprived selves down for a complimentary cup of Joe. 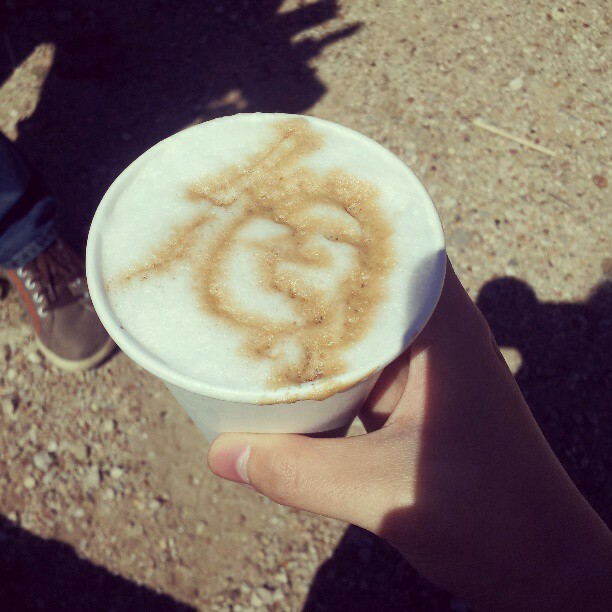 But GE’s Brilliant Brew truck wasn’t churning out just your average caffeine fix – the crew came equipped with robot coffee makers that will take your photo and draw them onto the foam as latte art. The best way to understand the simple technology behind this is to think of the coffee makers as printers. Baristas will start out by snapping a photo of you or a logo on your business card with their webcam. Then, a program simplifies the outline of your face or logo and draws them out as X, Y, and Z axes. Using this data, the coffee maker takes a syringe of coffee and draws out the axes atop your latte foam as one would with ink on paper. Essentially, the machine prints out the lines on the foam to craft a unique, personalized drink. I never thought I’d be vain enough to say this about myself, but I think I look better in person. At least the coffee version of myself tasted pretty darn good.